What Is a Hematocrit Blood Test? How Is the Hematocrit Measured? What Is a Normal Hematocrit? What Does a Low Hematocrit Mean? What Does a High Hematocrit Mean? How Is a Low or High Hematocrit Treated? In most labs, the hematocrit is measured by a machine that automatically determines a variety of blood tests referred to as the blood count (CBC). The complete blood count is a numerical listing of the hematocrit, as well as the hemoglobin concentration, and the three blood cell lines produced by the bone marrow (the red blood cells, the white blood cells, and the platelets). Another simple method is termed the spun hematocrit or "spun crit." A small amount of blood (about 0.05 to 0.1ml) is placed in a thin capillary tube, the tube is sealed with wax or clay, and then placed in a centrifuge to be spun. 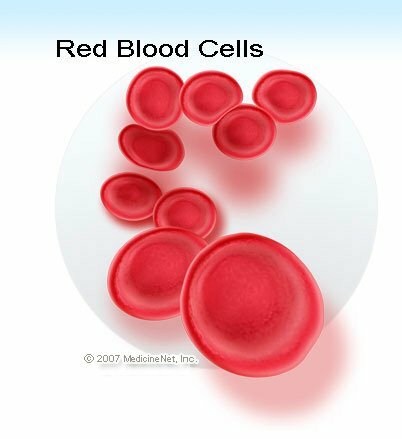 The red cells collect at the bottom and form a red column and are separated from the straw-colored serum column by a small area composed of white blood cells. The height of the total blood in the capillary tube (red cells, white cells and serum equals 100%). The height of the red cell column divided by the height of the total fluid in the capillary tube equals the hematocrit (percentage of RBC's in the total blood volume). This test can be performed in a few minutes. These values may vary from authorities in the field by as much as 7%. Consequently, it is best to have a doctor explain the significance of an individual's level of hematocrit if it is not normal. The treatment of high or low hematocrit depends on the underlying cause(s), the hematocrit level, and the overall health status of the individual. Most people are not treated with medications or procedures if the hematocrit is only slightly above or below the normal levels. Some patients with very low hematocrits may require intravenous iron, transfusions or medications to stimulate the production of red cells by the bone marrow. Some patients with very high hematocrits due to diseases, such as polycythemia rubra vera, may require blood letting (blood removal). The patient's doctor will decide when medication or procedures are necessary for each particular individual. In general, abnormal hematocrit values are monitored by doctors with routine blood testing. FDA.gov. Blood Products Advisory Committee. Topic II: Iron Status in Blood Donors. Nabili, Siamak N. MD, MPH. "Complete Blood Count (CBC)." MedicineNet.com. Updated Jan 24, 2014. Shiel, William C. Jr., MD, FACP, FACR. "Hematocrit." MedicineNet.com. Updated Oct. 19, 2015. What were the results of your hematocrit and what condition did it ultimately help diagnose? Have you been tested with a low hematocrit blood reading? What diagnosis did you receive from your doctor? Have you been tested with a high hematocrit blood reading? What diagnosis did you receive from your doctor?